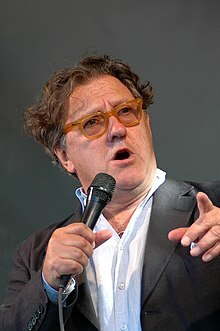 Bert Gustav Tommy Körberg (Swedish pronunciation: [ˈtɔmːʏ ²ɕœːrbærj]; born 4 July 1948) is a Swedish singer, actor, and musician. English-speaking audiences know him best for his role as Anatoly/"The Russian" in the musical Chess. He played the role on the 1984 concept album, and again on stage in the 1986 world première West End production in London. He has also performed the role several more times since then. Körberg has also played the lead role in many Swedish productions of other musicals. He represented Sweden in the 1969 and 1988 Eurovision Song Contests. He has also appeared in the Swedish productions of other musicals, usually in a starring role, including The Sound of Music and Les Misérables. He was a supporting actor in the 1984 Swedish fantasy film Ronia, the Robber's Daughter, based on the novel by the same name by Swedish author Astrid Lindgren. Körberg voiced the Beast in the Swedish dub of Beauty and the Beast, and also sang the Swedish version of the title song on the soundtrack. In the 1990s and 2000s, he took time off from other projects in order to recreate the role of Anatoly/"The Russian" in subsequent productions of Chess, including the 1994 tenth anniversary concert and the 2002 Stockholm production. For years, he collaborated with Monica and Carl-Axel Dominique in the experimental group Solar Plexus. In his own performances, he has worked extensively with Stefan Nilsson, and including songs by Jacques Brel. Körberg is also a frequent performer with Benny Andersson's band, Benny Anderssons Orkester (BAO), singing mostly dance music and music by Andersson. In 2008 he starred in the musical Dirty Rotten Scoundrels at Cirkus in Stockholm, and in 2009 he played Professor Henry Higgins in My Fair Lady in Stockholm acting opposite Helen Sjöholm, who portrayed the role of Eliza Doolittle. In the autumn of 2010 Körberg and his long-time friend Claes Malmberg gave a show in Gothenburg called The Big Bang Show. He was one of three judges on the Swedish reality television singing competition True Talent, which ran for one season in 2011. In 2013 he tried out for Eurovision in Melodifestivalen 2013 with the song "En Riktig Jävla Schlager" with the group Ravaillacz. They ended up in 10th place in the final. In 1995, he was invited as one of the seventeen Jean Valjeans from around the world to perform the encore of the Les Misérables 10th Anniversary Concert at the Royal Albert Hall in London. In 2017, he appeared as a guest performer on the album "Worlds Collide" by Swedish metalcore band Dead By April, singing on the last song on the album "For Every Step". In 1969, he won a Swedish Recording Industry Award Grammis in the category Best Debut Performance. Körberg was nominated for a Laurence Olivier Award in the category Outstanding Performance by an Actor in a Musical, for his role in the 1986 world premiere of Chess. For the 2002 Swedish production of Chess, he won a Guldmasken, the national Swedish theater award, in the category Best Actor in a Musical. Körberg was born in Norsjö. In July 2007 he married Anne-Charlotte Nilsson. 1988 – "Stad i ljus"
^ "Tommy Körberg". Nationalencyklopedin (in Swedish). Retrieved 9 May 2010. This page was last edited on 29 August 2018, at 21:32 (UTC).